I started Brenda's latest Word Play design last week and finished it up yesterday. It was a fun little stitch! 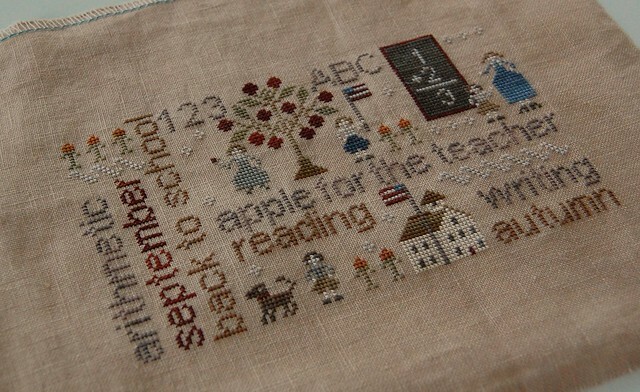 With Thy Needle & Thread "September Word Play"
What do you think of my new blog look? I thought it was time for a change! :) If you move your mouse to the arrow by the word "Classic," you can change how you'd like to view it. I thought that was a fun, new feature. Hope you all had a great Labor Day weekend! looks wonderful Nicole! This is the only one of the 12 I do not have yet....It is on order for me thou!!! I have stitched the January. Your new blog look is very nice....uncluttered!!! So cute, Nicole. I finished this piece too and had so much fun stitching it!!! Can't wait to see your finish!!! Very cute little finish.... I like the blog very clean looking! I love your finish Nicole. You did that one really fast. Love the blog look too. My blog needs a major overhauling - just haven't had time to do it. All of the wordplays are so cute! Great look for you blog too. Love your wordplay! So cute! So this look is the new look for blogger now? It's pretty slick, I have to say! Can you still do header pics???? Been thinking about you and your family, hoping all is going well. I love your latest finish. I think all of the wordplays are really cute. Brenda did a good job on all of them. Hugs dear friend and so looking forward to seeing you again. I really like the clean look of your blog and the Magazine feature view was cool! Love your finish, too! Love the choices in your new blog! I'm thinking of doing that chart. I love it and I taught for 30 years so I think it is very appropriate! Nicole, I am agreeing with Terri this time...the magazine look is cool and so easy to read. Very nice change but I always loved your blog and the great pics. Can't wait to meet you in MB in Oct. So many faces from blogland will be there to meet! I love the Word Plays, but have yet to stitch a one - will you do others?Great piece. Your new layout is bright and easy on the eyes. Like all the flip out features. Love the new look of your blog, too~ makes me want to change mine!! Very pretty finish, congrats! And the new blog look is so cool. Great finish Nichole! Those word plays are just too cute! I have played with the features on my blog also...love the magazine tab! It's too sweet!!!! I love it and congrats on the finish :-). Very cute finish. The new look is kind of nice too. beautiful and your new home in south carolina is simply fantastic! Beautiful stitching!!!! Love your kitchen so bright and cheery!!!!!! Sweet finish Nicole! Love the new look...very clean and classic. So very cute, Nicole !! !